Take a moment to imagine your annual family Thanksgiving. Notice the smile that’s on your face? Just hearing the word ‘Thanksgiving’ elicits many memories in one’s mind and savory flavors on one’s palate. This American holiday is taught from a young age as a time at which people give thanks for the wonderful things that life has to offer, whether it be family, food, and/or faith. This is often celebrated through a large gathering of family to take part in a commemorative feast each year. The feast and traditions vary with each family as they host their own ways to give thanks. Since Thanksgiving is celebrated at the end of November, the traditional feasts usually include various flavors that are characteristic of the fall harvest: pumpkins, corn, cranberries, potatoes, green beans, and so much more. But the main course food item that automatically comes to mind when people envision their family’s traditional Thanksgiving is… (drum roll please): the turkey! The turkey has become such a central focus point for this holiday that there are traditions associated with it, such as the President pardoning one turkey to not be slaughtered for this holiday, families engaging in the dangerous act of deep frying a 20-pound turkey, and people making wishes with a specific bone of the bird. But, what about the vegetarians and the vegans? Sure, the sides are enticing on their own, but many sides are often made with other animal products, such as stuffing, mashed potatoes, and more. Yet, have no fear! For those who are hoping to save a turkey this Thanksgiving, here is a cornucopia of 10 delectable recipes for veggie and meat lovers to rejoice over! This delicious recipe is simple and includes savory fall ingredients like mushrooms, cranberries, farro, and squash to send your tastebuds on a thankful ride this Thanksgiving. 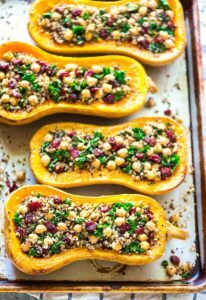 However, if you prefer butternut squash to acorn squash, here’s yet another stuffed squash recipe! While this recipe uses succulent cranberries as well, it also calls for an appetizing mixture of quinoa, chickpeas, and kale. Moreover, the recipe suggests the addition of tangy feta to top it all off. This tart is anything but! This vegan recipe provides a delectable, earthy blend of flavors paired with seasonal comforts of cranberries, mushrooms, roasted potatoes, and other tasty veggies. Gotta try it to believe it! This vegetarian recipes focuses on bringing out the cheesy side of the vegetarian options. You get the rich, smoky flavor of the roasted cauliflower and mushroom flavors paired with creamy goat cheese, what could be tastier than that! You could even enjoy this the morning of Thanksgiving for breakfast, or bring it out as part of the main course. And for those who are crazy about all things pumpkin, this meal is for you. 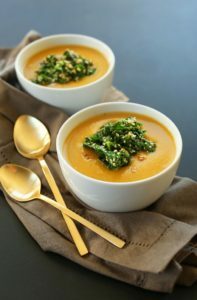 This soup allows any consumer to enjoy the simpler flavors of life while simultaneously warming their soul. Perfect for fall! Are you looking for those earthy, savory flavors that are often paired with a tender flaky crust? Then look no further as this is the recipe for you! This exemplifies the pairing of meaty mushrooms and savory, comforting flavors that everyone looks for in a pot pie. 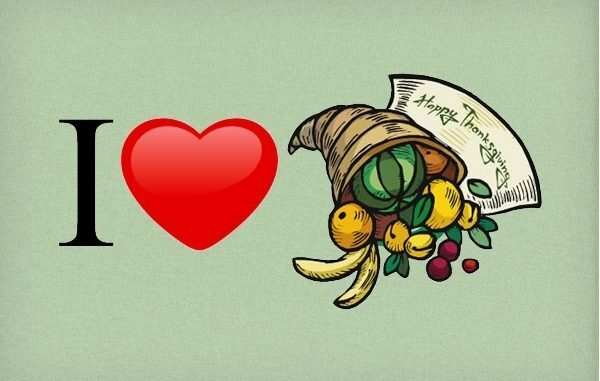 Perfect for any food lover! For those who are looking for another veggies filled comfort food, this is the tasty recipe for you! 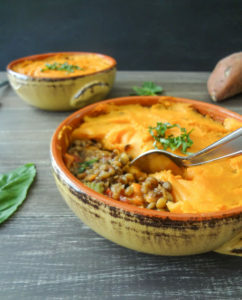 Imagine a warm layer of lentils, carrots, celery, basil, tomatoes, and spinach topped by a creamy layer of mashed sweet potato… if that doesn’t exemplify warm family comforts in a food, I don’t know what will. Looking for something a little different? 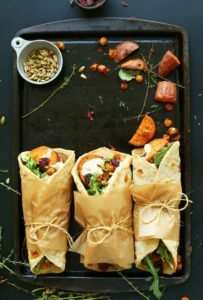 This great Thanksgiving Wrap is lusciously filled with roasted chucks of sweet potato, crispy chickpeas, tangy cranberries, nutty sunflower seeds, and finished with a zesty garlic dill sauce, all within a tasty naan or pita bread. Here is another cheese-filled tastiness! This recipe intermingles Italian flavors, like basil, red wine, and eggplant with the earthiness of the portobello mushroom and the sharp flavors provided by the gorgonzola and parmesan. And they are the perfect portion size for any Thanksgiving feast. Are you also a giant fan of stuffing? But do you also like a tad of sweetness? Then this is the stuffing recipe for you. Think of crisp and tangy apples, a pinch of cinnamon, satisfying sweet potato, and crunchy hazelnuts, and that’s what you’ve got in this mix. Salavating yet? Not only is this a great option for those who favor vegetables over meat, it’s also a fabulous gluten-free option. As anyone can see, there is a common trend among these vegan and vegetarian recipes, such as mushrooms, cranberries, sweet potatoes, carrots, and more, but all are flavorful and perfect for this wonderful holiday of feasting and thankfulness. Mind you, these represent a very small collection of Thanksgiving vegetarian and vegan options one can indulge in either this year, next year, and every year after that. 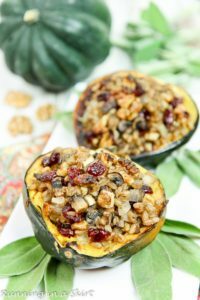 I, personally, can’t wait to share the tantalizingly stuffed Acorn Squash this year with my family! Which recipes are you going to try?